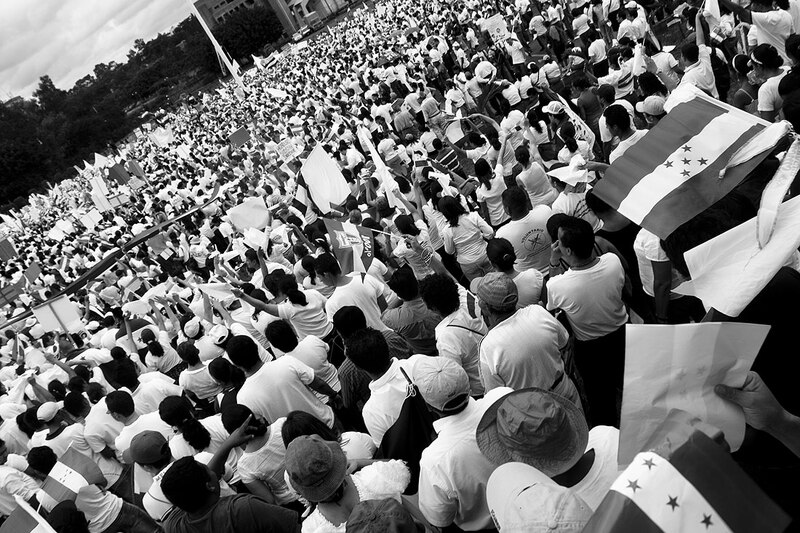 Commondreams pushes common myths, repeating the lies spread by the autocracy-friendly news sources during 2009, when Honduras pushed back against Zelaya’s illegal and unconstitutional auto-coup, and restored its freedom from imperialist intervention by foreign powers. Facts #1: There was no military coup in 2009. Honduras is a constitutional republic and Congress is an elected body, and the President is an elective office. As in any people that repudiates dictatorship, the idea is to separate the powers. In 2009, elected President Zelaya became Self-Appointed Autocrat Zelaya, and dictator in a real sense. According to the ideals of freedom and constitutionality, the Honduran people did NOT elect the autocrat Zelaya, to make laws, they elected him to run the country according to the laws that were passed by Congress. Instead, he began issuing his own decrees. He refused in November 2008 to submit the required budget for 2009, as he was constitutionally required to do. The Honduras Constitution says that if for some reason there is no budget for a year, then the default budget is the same as the previous year. But Zelaya ignored the law and began spending the tax receipts according to whim, no decree to let people pick at. And much of it of course secretly. No surprise there about corruption. When Jorge Ramos of Spanish-language US-based network Univision asked him about rumors he had won the election by cheating, he didn’t even try to hide it, proudly saying that “everybody does it”! At least that was a moment of honesty. The SUPREME COURT, not the military, ordered Zelaya arrested after he flaunted his actions and even loudly expressed contempt for court orders to cease and desist from his long series of many illegal activities: “I don’t have to obey any pipsqueak judges”. The military obeyed the constitutional court orders to arrest him for a list of criminal actions. His open and vocal advocacy for presidential re-election is defined in the Honduras Constitution as “treason”, because they did not want incumbents cheating their way to life-time dictatorships. The Honduran people were almost unanimous in repudiating him. The Catholics Protestants came together in a way hardly ever seen in the Americas, all the industry groups, Chambers of Commerce and many unions united against Zelaya’s coup attempt, rich and poor. The only identifiable groups that supported his dictatorship were the usual “leftists” who openly advocate centrally dictated planning, and the teachers’ union, who left students without education for those months. Parents in one very poor town took over one school when the principal closed it to sympathize with the strike. The CONGRESS, not the military, voted to recognize that Zelaya’s actions themselves had already vacated the presidency, according to the Constitution. COMPOUND MYTH #2: “These territories are the Garifuna people‘s and can’t be handed over to foreign capital in an action that is pure colonialism like that lived in Honduras during the time that our land became a banana enclave,” said Miriam Miranda, president of the Fraternal Black Organization of Honduras. FACT #2: The lands that would be ceded to this project are UNOCCUPIED. This spokesperson is also and advocate of robbing land that belongs to ranchers to give it to other people free of charge. This is not colonialism because the sovereign government of Honduras and representatives elected by the people of Honduras have enthusiastically invited this foreign investment to come into the country according to principles they see as good for themselves. The Cuban government also has invited foreign investment, and even China sees benefits in allowing Hong Kong to govern itself in a manner friendly to the free market. Heavy-handed dictates are the opposite of the free market. FACT #3: The statement by Oscar Cruz is an oxymoron from the contextual premise. Stated a better way, he contradicts himself. These cities do NOT involve “state powers outside the jurisdiction of the government”, because they are a CREATION OF “the government” and by agreement of the state. This project is constitutional because the Congress amended the Constitution according to rules for amending the Constitution within the Constitution itself. Which is more than the unelected self-appointed “spokesperson” for the Garifunas can say. And there is another bigger issue in which both Oscar Cruz and ALL the critics are self-contradictory. These are people and activist organization that very loudly support the organization of communes run by state-appointed personalities for purposes known only to those who institute them. In other words, do they have a problem with political appointees who make the rules for centrally-planned industries? Obviously they do not have such a big problem turning over the entire country to a self-confessed corrupt autocrat like Manuel Zelaya to run as he pleases. “In the name of the poor” of course. The whole principle that bothers them so greatly about this project is the free market principle of letting the poor compete with the rich instead of having the state dictate all the outcomes. Where were these protests when Zelaya simply capitulated and handed over a disputed island territory to Nicaragua? Controversy? Oh really? Because maybe 5% of the country might be opposed, while these same opponents are the same ones that advocated letting Zelaya run the country like a fiefdom? Well, it’s only a “small part” true, and “large part” a lie. How much controversy is there? You can find a clue in the vote by Congress to create these special administrative zones: 126-1. That’s a real controversy. No, the controversy is from a handful of well-funded leftist groups that lackey press organizations like the AP and apparently The Guardian run to whenever they know that statist central-planning pushers won’t like something. Where do those guys get so much money anyway? Who funds them? They always are talking about the rich, are they funded by starving peasants? How long can they kid us and get away with this ruse? Then there is this precious gem from Ismael Moreno, worthy of a good belly laugh. They present it as an environmental concern but the objection is that it would end up “eliminating the last agricultural frontier left to us”. But the project will rather open that agriculture, and provide a new market with new demand for the projects of agriculture. Specialization of labor multiplies production in all economic sectors, but it requires capital investment by investors that have capital. The land they are talking about using is IDLE and at present I suppose it is government owned land. It apparently has not attracted demands for land distribution from the usual so-called self-described “agricultural reformers”, because they instead sent their small squad of “peasants” to invade lands under productive cultivation by agricultural investors, in an area called “Bajo Aguan”. This is land that is not generating taxes nor productive activity. There will be property taxes, and that’s more than it’s getting at the present. The agreement includes a requirement for a major percentage of employees to be from Honduras itself. So if there is any profit in this land its value will go up and there will be tax revenues, and a great number of Hondurans will find productive work, according to as much as they can get based on their productive bottom line. If they are underpaid, it is because they did not find a free market for their contributions but a regulated one. But if they wanted a regulated one they could just work anywhere in Honduras outside these zones. How has that been working out for them? I was a missionary and helped the poor directly with food and other needs. It makes you feel good to help people who need it. But you don’t help them by taking them food every day for their entire lives. That’s okay for dogs and cats and pets, but not people. But I’ve learned that a free market environment is the very best way to help the poor, and to allow the ones that can to create their own new opportunities instead of being shackled to poverty by the paper ceiling of rules, laws, taxes and regulations. Here’s a chance to prove that we can all work together on behalf of terminally ill patients. All that compassion to “let them just die” can be turned to something we can all agree is good. A natural form of the vitamin, Pyridoxamine, was recently yanked off the market by the FDA. Why? Because a pharmaceutical company, BioStratum, wanted sole use of pyridoxamine in a drug, a drug which may or may not ever appear. The company filed a so-called citizens petition and the FDA agreed, notwithstanding protests from ANH-USA, other organizations, and thousands of citizens. You might ask: how can Pharma take a supplement off the market and claim exclusive use of it as a prescription drug? The FDA does not presently feel obligated to answer this question. So why is it again that we have such a benevolent government that convinces us to deny denying the cancer patients that suffer the worst pain that ever afflicts a person while awaiting death, and deny them new (and old) treatments that might have a chance of helping them if they want it. But then some governments make it easy for them to die right now. That’s “dignity” and some even call it compassion, but they won’t advocate for setting drugs free from the shackles of government, and don’t realize (some probably do) that they are only helping Big Pharma by demanding more central command and control. The science of course just keeps lining up and pointing to Creation, to Genesis, to nature’s God. Scientist Dr. Russell Humphreys again makes an accurate prediction of the magnetic strength of a planetary field, on the assumption that the universe was created in six days when the Bible says it was, about 4,000 B.C. Two of his predictions are validated. One, that the field is much stronger than the long-ages and anti-creationist scientists expected, but Humphreys had it right. Two, it is losing strength way too fast for a long age. Another “sign” for those who want to know the truth. >>You believe there should be no laws or regulations on drugs? legal or illegal? Illegal: What is more dangerous? Drugs or the drug wars? Ron Paul questioned the audience at a debate once: If drugs were legalized today, would you rush to get heroin tomorrow? Why should we create an 1000% profit margin for the bad guys? Legal: What good does it do? It creates an artificial barrier to (a) you getting the drugs you need because the supply is artificially and unfairly limited to keep up profits and help Big Pharma (Oh, you thought they were to stop big mean Pharma from poisoning you?) and (b) it makes the gullible consumers of government-approved media feel “safe” because good old Uncle Sam is “protecting” them. Do you have any reliable idea about what aspartame (approved by the FDA) does to you. Is that okay with you? >>Since we are not going to be interfering with auto manufacturers, airbags would not need to be effective, or even installed. >>You would rely on your church for providing your hospital care. Like before LBJ messed it all up, and the Catholic hospital he worked at never turned away anybody for lack of money, and before billions of dollars pumped up the demand side of hospital care with free money from a bottomless payer. That payer confiscates whatever it can get and has a backup printing press when honest people run out of money. (3) I know he took care of a lot of people free. Free. Just like the our neighborhood lawyer, one Keifhauver or something like that, good man, he did pro bono all over the place for the poorest of us. Tried to help bad guys turn around, let them off near my Dad’s church, hoping they would wander in and change… Some do sometimes..
Everybody was a lot healthier then too. We didn’t see so many fat folks then. People ATE healthier food, didn’t get sick as much. Except for places in the world where government cronies confiscate their “fair share”. >> Would you be in favor of dropping all highway speed limits? Do you know how they set speed limits today? You think it’s experts judging “safe”? It’s REVENUE. Confiscation excuses. That’s why they love red light cameras. It’s revenues. And they hit the poor the worst, and we know you love that, because when health care is rationed, the rulers get the best care and poor get leftovers. Some use a different method. They measure traffic speed on a road and set the limit at a high percentile, say 90 percentile, meaning whatever makes lawbreakers and gets revenue from 10% of the drivers. Almost all people drive reasonably. There are private farms and roads and how often do you think people drive crazy on them? >>State universities and colleges would be disbanded? Public education would be eliminated, and there would be no way of knowing how your hot dogs are made. Speaking of hot dogs, that’s just a bunch of pure baloney. Best thing that could happen to education, and black folks and poor folks are demanding more charters, for a little bit more freedom. Where would be today without the unfettered, unchained education of Isaac Newton and Francis Bacon and Michael Faraday? The Pilgrims made sure they had schools so the kids would be able to read the Bible. Literacy around 1900 was around 95% in the Protestant nations, about 80% in the Catholic countries, and 30% elsewhere. St. Patrick led the entire island of Irish to Christ without government help and taught them to read and write without government help and they saved the Greek and Roman classics without government help and without robbing their neighbors like governments do. That’s right, Rome couldn’t help him because they were busy watching the Vandals and the Visigoths burn their books, including Augustine’s. So when Charlemagne looked for somebody to bring learning back to his dominion, he looked north to the Irish and the British who had been infected by the Irish with education. Christian schools produce graduates that score way better than the government schools, and home schoolers are walking home with the academic prizes and winning academic competitions and moot court debates in multiple times their numbers. >> Unions could use secondary boycotts? Bribery of public officials would become SOP, and prostitutes can be recruited in the church Sunday Schools. Unions are a racket the hurt the poorest of the poor, making the marginally employable into unemployable, and limiting productive activity that could raise all boats for everybody. Bribery of public officials is done today, except it’s done in “legal” ways handled by the legislators, PLUS there’s no way or reason to bribe a government official that doesn’t exist. You have to bribe somebody in the free market instead by offering him something of real value. Prostitutes won’t be looking in Sunday schools for their john’s, they’ll wait till the guys are away from their wives and their Moms, just like today. The guy Gaddafi said to his own Parliament and to his whole country, blacked out by the media in the West, that his nation had become a pariah in the world for supporting terrorism and they were renouncing it and denouncing it. He stopped his nuclear program and invited the UN (yep, NATO too) into the country to take out the nuclear material. Almost alone among Arab countries, he his speeches and writings told the Arabs and the Muslims to learn to live in peace with their Jewish neighbors in Israel and envisioned a nation where they could learn to live as such and with his talk of an Isrealtine, and the world called him crazy for this. Don’t listen to such crazy talk. He established a new currency based on gold, meaning the “dictator” could not control the currency or willy-nilly print money and rob purchasing power from the poor and middle class as happens in the Western “democracies” and in Communist countries too. He became the worst enemy of al Qaeda in the entire Middle East. For all this, America and NATO, led by Obama at France’s desperate prodding, waged war on him, financed fighters “formerly” of al Qaeda and Muslim Brotherhood, to help them overthrow him. Now they have mobs led by those al Qaeda militia and their spiritual counterparts engaging in operations to destroy diplomatic missions and assassinate the ambassadors. Surprise. Some people are going to ask if I’m “defending” him. That’s an indoctrinated automatic reaction on their part. It should be obvious I’m not. But you have to ask yourself some things. Syria’s Assad was watching. Ahmadinejad was watching. He was also watching Obama and the U.S. and the West when 100s of 1000s of Iranians hit the streets to demand change and more freedom. Some of know the end. Of the prophecies, none shall lack her mate. I”m sorry, but in the fine 2000-year-old tradition of calling whited sepulchres and snakes and vipers as they are. Well, maybe he’s the second worst now, we got another contender in 2008. The photo is very appropriate to this statement, he has an other-worldly look in his eyes, like he’s not seeing reality. The US has one of the worst, he says. He is now worthless. He came back from North Korea saying it wasn’t worth pressing North Korea to treat its citizens with more respect for their rights. Paper receipts mean nothing if you have about 50% more registered voters than the demographics support, and if the opposition only has one channel that they can sometimes say something on, and if half the influential dissidents are in prison. That’s what is going on in Venezuela where the press is also under all kinds of regulations that control the content. It’s a farce. In view of Rick Warren’s flip-flop about homosexual marriage, and his approach to using government money confiscated (“stolen”) from other people to fund his projects, one must ask about his own Biblical illiteracy. His problem with Biblical literacy is most visible in the fact that he quotes liberally from 15 different translations of the Bible in some of his books and pretends they are equally valid. That’s one issue. Then Brownstone does an association-link with another issue and says Rick Warren “has a lot to do” with a “scientific illiteracy” problem. Seeing that she brings Darwinism-deniers into the mix and mentions Ken Ham, presumably she sees rejection of Darwinism as scientific illiteracy. Well, well. That’s news to Isaac Newton and his friends in the heavenlies right now, and it’s causing a laugh riot for a battalion of angels who are also sad to see people who believe in theories created by men who denied Creation and went trying to find a different explanation. Blaise Pascal, Kepler, Kelvin, Michael Faraday, Pasteur, Linnaeus, the list goes on and on. So was Isaac Newton afflicted with “scientific illiteracy” for believing in the six days Creation? Oh wait! You say it’s because he hadn’t come across the brilliant “discovery” of natural selection by Charles Darwin? New? Hah. Greeks in the 5th and 6th century wrote various similar theories. There have been various version of “Darwinian” theories since Darwin, too. Maybe, just maybe, Darwin knew about them. One wrote about animals over time having descendants that were different, and all animals were related. Yes, we were not taught this in our public schools. We were never taught about the strong faith of the founders of the main branches of science of today. “Historically ignorant” science books taught us that Columbus “proved” that the world was round, whereas in the real world every knowledgeable person around the world knew this from the times of the ancient Greeks, and it’s even in a verse in Isaiah. Not that the tautologies used to stamp Darwinism into young minds are any good explanation. They are many, and the list is growing leaps and bounds as young scientists with open minds discover the facts that were not taught them in college courses, or they apply the logic rules they learned to the issue. Nobody can accuse Michael Crichton of “scientific illiteracy” but he is so accused of same in the mix because in said article anybody who doubts the unquestionable dogma of global warming is so accused. He exposed it for what it was, and that was before Climategate exposed the fact that they have to commit fraud to make the thing stick. There is one guy who tore into the infamous Climategate study, tore the methodology to shreds, who now advertises himself as a “convert”, never mind he was recorded as saying he believed in it, just that it needed better methodology. Never mind his own study has been exposed as having its own ugly and untenable and indefensible practices. Back to “scientific illiteracy’. NASA’s scientists with all their billions of years of wisdom, made predictions for the magnetic field strength of the planets Uranus and Neptune. What a surprise, they were orders of magnitude wrong, wrong, wrong. Creation scientist in physics and large-scale magnetic phenomena, and inventor with dozens of patents with his name on them, Russ Humphreys, made a different prediction. He was spot on. His predictions about the rapidity of the decline in the magnetic field of Mercury, also very very close to what it turns out to be, show there is some prediction power in believing that Genesis One is a historical narrative that tells us how God did it. We should make it stick. The “leftists” are already whining about this. But what can they say? Hondurans told the world in very clear terms already in 2009 that they were not stupid as a people, that they do NOT want to sink into the abyss as another little Venezuela or Cuba. Forget that! The Honduran Congressvoted for the legislation almost unanimously, 126 to 1.China has a special zone called Hong Kong, and some my wife told me that some of the talk in Miami is that it will be a little bit like Switzerland. It’s sounding like an investor’s ideal situation, and really free market oriented and minimal regulations. Maybe even some poor people can finally have a chance to get some upward mobility in such a situation. My wife’s from Honduras, so I’ll be watching this closely. Man, I’m so glad they made the decision for freedom in 2009. So with the FDA in the USA requiring endless studies and never-ending inspections, and requiring all kinds of labels and warnings, how did genetically modified foods get such clear sailing? It’s reasonable to believe this study, the genes in corn are what makes it corn, but it’s the combination of them really, plus the epigenetics around it. The DNA molecule itself is a think of awesome complexity by itself, but in combination? Tinkering with it is a great unknown. And so what else is hidden behind crony government? Looks like there may be a difference between the Libyans and Arabs in the other countries. Remember that it was Libya, more than any other country during the so-called “Arab spring“, where massive numbers of common citizens took up arms to defend Gaddafi‘s government and push back against the al-Qaeda-infested and Western-backed “rebels”. Note that Gaddafi’s visions of society saturated the country, and he was the only one to balk against the international banking control regimes and make real gold the value of the currency. Western media were sorely negligent also in reporting his public comments to the West and to his people about his renunciation of terrorism and giving up his nuclear program. Ahmadinejad surely has noticed what happened to the leaders who did what they were told and gave them up. What has he got to lose? I am a bit surprised at it the Libyans burning down the militia centers that the felt attacked the American diplomatic mission in Benghazi. But this is even more evidence that the attacks were not a spontaneous reaction to an obscure video nobody heard about until it was used to blame the demonstrations. Somebody wants Muslims to associate the date with themselves and with Islam, and with their anger at the West….